If interested, you can head over to the PlayStation Blog to see some images of the special editions and what they come with. For the most part, I’ve really liked what I’ve seen in all of the trailers and gameplay released for Days Gone so far. I can’t say I’m a fan of running zombies, which is what this game looks to have an abundance of, but I just remind myself that these aren’t supposed to be zombies. They’re sick people who are still technically alive. Who require food, sleep, and as you’ll see in the first video below, water. One thing that has me a little nervous though is the jump scares, which I hate more than running corpses. From this video alone it looks like jump scares might happen often, and that could do some damage to the final product. At least for me personally. Some folks love a good jump scare. Which is like loving a good random punch to the gut by a passing stranger. All I know is I’m already dreading all of the car trunks I’m going to have to anxiously open in hopes of finding useful items knowing a tiny OshKosh B’gosh non-zombie is probably about to jump out onto my face trying to give me its Freaker cooties like a horrible Jack-in-the-box covered in the flu virus. I cannot get sick right now, I have a meeting tomorrow. If you’re sold on the game you can pre-order a copy of the Standard Edition, the Digital Deluxe Edition (not available at the writing of this, but should be available at the link soon), or the Collector’s Edition now. 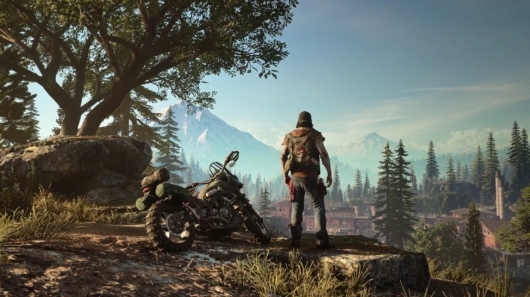 Days Gone will be released on April 26th.